UNITED NATIONS, September 15 -- In the wake of Myanmar dissolving the National League for Democracy of Aun Sang Suu Kyi, the UN Wednesday issued cautious criticism in response to a question from Inner City Press, while implicitly admitting the UN and its envoy Vijay Nambiar cannot or simply do not speak with the parties there. Previously when Inner City Press has asked UN spokesman Martin Nesirky about the NLD being absent from the upcoming elections in Myanmar, which many call a scam, Nesirky has responded with a UN position that the NLD was free, and chose, to boycott the election. 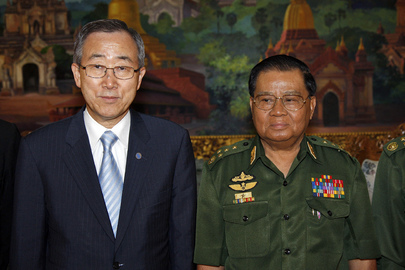 But now that the government has dissolved the NLD and other parties, the UN finally had criticism ready. 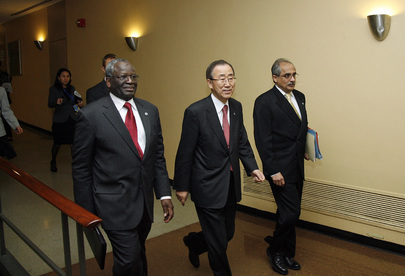 Did it come from UN envoy -- and chief of staff to Secretary General Ban Ki-moon -- Vijay Nambiar? There is no way to know. When Inner City Press what Nambiar and his “Good Office” team have been up to, Nambiar first said “you are well aware.” That is not the case. For example, did Nambiar know in advance of the impending dissolution of the NLD? Nesirky would not say. Inner City Press what Ban plans to come out of the September 27 meeting of his “Friends on Myanmar.” While already for the similar meeting about Sudan on September 24, also during the UN General Debate, there's talk of an outcome statement about the planned referendum, Nesirky merely said to watch for a press availability after the September 27 meeting. Inner City Press: On Myanmar and something about MDGs [Millennium Development Goals] promotion, promotions by the UN. On Myanmar, the National League, the NLD [National League for Democracy] has been dissolved by the Government. They had previously voluntarily chosen to boycott the election, and I think the UN had said, well it’s up to parties what they want to do. But now the Government has dissolved them and the party. The NLD has said that this is an illegal move by the Government, that they’re protesting the dissolution of their political party by the Government. So I’m wondering, given the good offices role, given the run-up now to this election, what’s the UN where it previously it sort of said, “well, the NLD can boycott if they choose”, what about the Government dissolving this historic force for democracy in Myanmar? Spokesperson Nesirky: The Secretary-General notes with some concern the decision by the Union Election Commission to dissolve 10 political parties prior to the general election, including the National League for Democracy and four others for failing to renew their registration, and he further notes that the Union Election Commission has issued campaigning guidelines for the remaining 37 parties to register to contest the elections. The Secretary-General once again urges the Myanmar authorities to ensure conditions conducive for a fully inclusive and participatory electoral process. Inner City Press: Thanks a lot for that. What’s the involvement of Mr. [Vijay] Nambiar in the good offices and what does the Secretary-General hope to come out of the meeting of the Secretary-General’s Friends on Myanmar in the upcoming general debate? Spokesperson: Well, I think you’re fully familiar with Mr. Nambiar’s good offices role related to Myanmar. The Group of Friends meeting, which would be at ministerial level, is likely to be on 27 [September]. Further details are being worked out on that, including press availability, and I think at that point, after the meeting, you’ll be able to find out the content of the meeting. Inner City Press: Just about Mr. Nambiar, because I’m actually not clear on what the office does. I wanted to know, on something like this, did they know in advance that this decision was being made by the Government? Had they spoken to the NLD about these concerns or are they just reacting to the stories about it? I don’t meant that insultingly, I just mean, I’m just trying to get a sense, did that office try to forestall this decision by the Government, or are they as mystified as everyone else? Spokesperson: Well, there are a couple of things here. Mr. Nambiar has support, people who are obviously able to help him, who are monitoring this daily, the whole time. Therefore, they will clearly have been aware of movements. What the diplomatic process might entail, I’m not in a position to say. I would reiterate what the Secretary-General himself has said. He’s expressed his frustration here on the access to the Myanmar authorities to talk about these kinds of things, so I think that might answer your question. So if Mr. Ban cannot speak with the Myanmar authorities, despite the UN allowing them to take up to 25% of post Cyclone Nargis aid money and declaring the response one of his finest hours, it seems clear that Mr. Nambiar can't either. What Good Offices? Watch this site. UNITED NATIONS, August 23 -- In the run up to a November election which will exclude Aung San Suu Kyi and her National League for Democracy, the military government of Myanmar has moved to curtail the system of entry visas for aid workers instituted after Cyclone Nargis. While one might expect the UN, whose Secretary General Ban Ki-moon once claimed this post-Nargis access as one of his major accomplishments, to speak out against this re-closing down of Myanmar, that has not been the case. 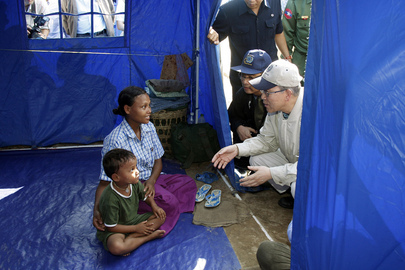 At the 43rd ASEAN annual meeting Hanoi on 19–20 July 2010, the ASEAN Foreign agreed to officially to end the Tripartite Core Group (TCG) and the ASEAN Humanitarian Task Force (AHTF) by 31 July 2010 and to transfer the coordination role to the Government. In light of the Government’s announcement that Nargis related work will be taken up by the relevant line ministries, the UNCT is engaging closely with the authorities to ensure that needed assistance in not interrupted. There are today 15 UN agencies, 50 international organizations and a similar number of local NGOs operating inside the country and are working not only in the Ayeyarwaddy delta, but in all regions of Myanmar. Looking forward, the United Nations and the Government of Myanmar have reached agreement for collaborating on a two-year Joint Humanitarian Initiative (2010-2011) for Northern Rakhine State, a border area whose population faces a particularly difficult combination of socio-economic and humanitarian factors. So will the UN's current push for Pakistan end with a similar whimper? By which time, of course, the scam election entrenching the military dictatorship will already have taken place -- with what to some now seems the de facto “blessing” of the UN. Watch this site. At UN, Aung San Suu Kyi Absent from Ban's Statement As From Myanmar "Sham" Nov 7 Election: Good Offices?